Women’s handball in Denmark has for a long time had a love affair with players from Eastern Europe. It has been a match made in heaven. While Denmark is generally seen as offering higher living and social standards than Eastern Europe, players from Hungary, Romania, Poland and the Balkans have been able to boost the general level of handball in Denmark. In women’s football, Eastern Europeans aren’t in such high demand. However, there are exceptions and that category fits captain of the Romanian national team, Florentina Olar. After one year with S.S. Lazio and three seasons with Apollon Limassol, Olar arrived with her countryman Laura Rus in the Danish 3F league five years ago to play for Fortuna Hjørring. “I always knew I had to leave Romania to pursue a professional football career. When I began playing at 13, women’s football was not so common in Romania”, says the native of Constanta who today has earned more than 150 caps for the Romanian national football team. “In Denmark girls can start playing when they are five years old and the level of football is much higher than in any of the other countries I have played in. Everything is better in Denmark… well, apart from the weather”, she adds with a smile. Olar was persuaded to accept an offer from Fortuna Hjørring in 2013, mainly because she was impressed with Fortuna’s concern about integrating foreign players. “I really liked that the club doesn’t really only think of me as a player but as a person. They understood that if I have to perform well on the pitch, I also have to be happy outside the pitch. And therefore they helped me bring my husband and my dog with me to Denmark”, explains Olar praising the club who reached the final of the UEFA Women's Champions League in 2003. Olar operating in her favorite position as attacking midfielder was an instant hit when she arrived. She has helped the club win two Danish titles and she was voted Best Player in the 3F League in the season 2015/16. 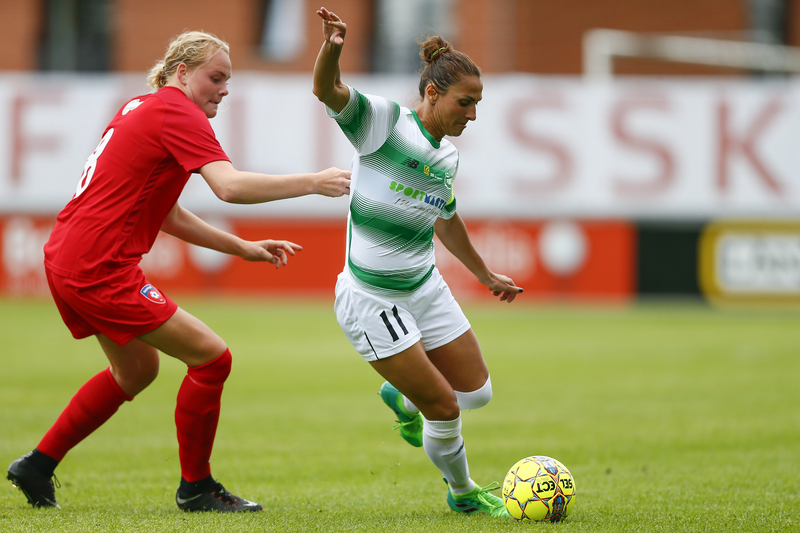 Indeed she has been one of the biggest profiles in the 3F league for years but it wasn’t all roses and sunshine when she arrived at the club in 2013 and had to adjust to the Danish culture on the field. “Here, if we lose then the girls can still smile a couple of hours after the match is finished. In the beginning I couldn’t understand that because I was still upset. The Danes are much more relaxed. They say ”kom igen” (”Try again”) but for me a defeat is heartbreaking. Sport is different in Denmark. If you don’t succeed in sport, you can always go and do something else, get a job, etc. That is not the case in Romania. In Romania you don’t get three or four extra chances if you fail in sport. It’s almost a matter of life or death”, emphasises the Romanian player. The 32-year old Olar just gave birth at the end of March but is still planning to return to play for Fortuna. “I kept playing until I was three months pregnant but my last game was in September against Brondby. Then I could not risk it anymore”. Florentina is still to decide what to do when her contract runs out next summer. “My priorities have perhaps changed a bit now that I have a child. I still want to compete, do well and help Fortuna to success but perhaps I am not quite as ambitious as before”, she believes. However, Olar doesn’t lose a chance to promote women’s football, and maybe that’s a sign to read between the lines of what she’d like to do in future. “Women’s football generally doesn’t get enough recognition. They should broadcast more matches and that would also attract more sponsors. I know there are some differences to the men’s game but if you look at the level of the Champions League final between Wolfsburg and Lyon, the level was so high. And now after I have given birth, I am thinking that there is nothing women can’t do. They can do everything, we should be recognised for it”, ends Olar.